Today is Cinco de Mayo—May 5—and tonight, Mexican-themed restaurants and bars will be crowded with American revelers who are not quite sure what they are celebrating. If queried, many would say they’re honoring Mexico’s Independence Day. (Sorry, but that’s actually September 16.) For the record, Cinco de Mayo marks the anniversary of a battle for Puebla fought in 1862. A barefoot and under-equipped Mexican army miraculously defeated the French in a fight reminiscent of David and Goliath. But why let the facts get between you, some great grilled Mexican food, and a couple of long-necked Coronas or margaritas? Speaking of margaritas… No Cinco de Mayo celebration worth its, er, salt—would be complete without this iconic cocktail. The Raichlen version has a smoky twist: real-deal mezcal distilled from smoked agave hearts (I like the Del Maguey brand), blended with fresh lime juice—I wouldn’t object if you grilled the lime halves before juicing—a little Cointreau or other orange-flavored liqueur, and a bit of agave for sweetness. Extra points for smoked salt around the rim of the glass. Here’s a basic recipe. Next up: the quesadilla’s sophisticated cousin, tlayuda—a classic Oaxacan street snack comprised of corn tortillas topped with beans, cheese, avocado, and tomato. (Try the high falutin’ version at the terrific Casa Oaxaca in the colonial city of Oaxaca.) So how do you keep the filling from spilling out of the tortillas? Enter the Best of Barbecue quesadilla basket. Find the recipe here. Or serve tortilla chips with fire-roasted salsa. The main course? Tacos al Pastor—“shepherd’s tacos.” Like many totemic dishes on Planet Barbecue, this one borrows from several grilling cultures. Similar to Middle Eastern shawarma, Turkish doner kebab, and Greek gyro, the meat is traditionally roasted on a vertical spit on a charcoal fired rotisserie. Pastor (shepherd) was the nickname Mexicans gave to Lebanese merchants who immigrated to the Yucatán and to Mexico City in the early 1900s. Thin slices of spiced pork are impaled on a vertical spit until they create a dense cone of meat. 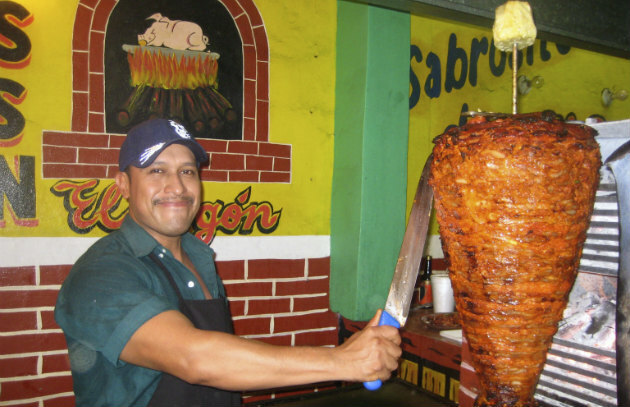 A peeled pineapple tops the spit, and is served in tortillas along with meat shaved off the sides. I’m going to assume you don’t own a vertical rotisserie, so my method relies on direct grilling. Click here for the recipe. And to round out the menu, another Oaxacan street food classic: elote, grilled corn with mayonnaise and cheese. Shuck the corn, grill it over medium-high heat until browned—even a little charred (8 to 12 minutes total). Slather each ear with mayonnaise, then sprinkle with grated Cotija cheese (if you can’t find it, substitute feta or parmesan), chili powder, and chopped cilantro. Finish with a squeeze of fresh lime juice. If anyone has room for dessert, offer wedges of fresh watermelon or cantaloupe sprinkled with lime juice and cayenne pepper. Olé!